Just like baking in the kitchen; the right ingredients make a huge difference when minerals were formed. A slight change in the ratio of elements or the addition of some creative impurities can totally change the resulting mineral. 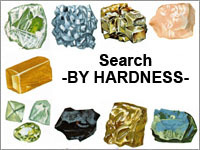 Use the 'Search Minerals By Chemical Composition' guide to view small thumbnail images of mineral samples which have been arranged by their base elemental building blocks.